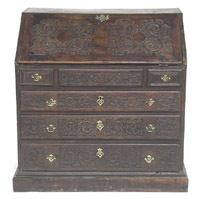 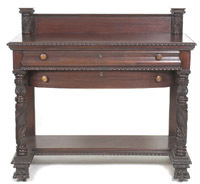 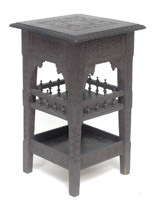 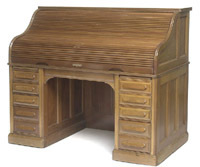 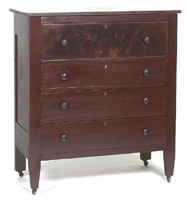 Fine Offering of Cincinnati Art Carved Furniture: All in traditional black walnut, unaltered and in original finish. 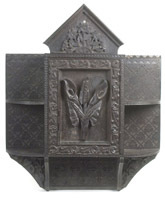 Three-tiered stand w/geometric edging, deep & narrow relief ivy, Stylized sunflowers & classic stippled background, 34"h x 20"sq. 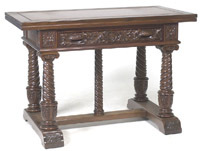 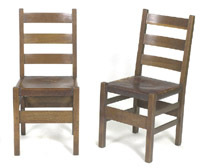 Henshaw, Cincinnati: Outstanding carved 12 piece dining set of flamed mahogany. 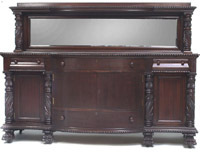 Massive bowfront mirrored sideboard, China cabinet, 2 drwr server, 60" round tbl w/fluted edging, 5 leaves, 8 chrs. 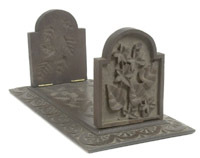 Carving includes wrapped Acanthus leaves, capitaled columns & pineapples, all on massive paw feet. 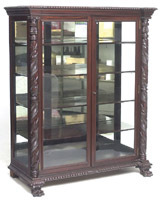 Rich original finish and superb condition. 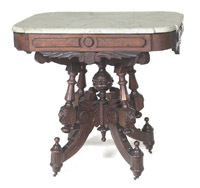 Shaw Furniture Co: Italian Renaissance 10 piece walnut dining set. 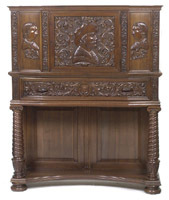 Striking forms all deeply carved w/faces, oak leaves, acanthus leaves & vines. 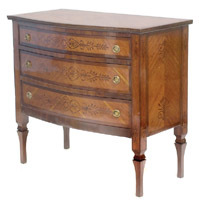 Turned twist legs highlight the spectacular set. 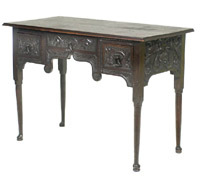 Elegant table, sideboard, tall mantled china and server. 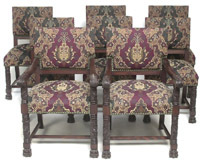 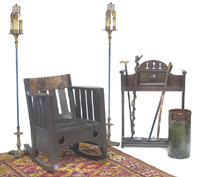 6 spindled armchairs incl two "King's" chairs, all w/carvd medallions. 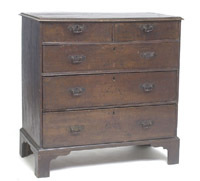 Made in the finest Grand Rapids tradition by Shaw Furniture Co.. Rich original finish and superb condition. 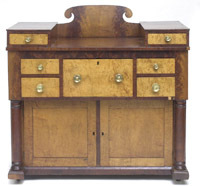 Walnut Victorian cylinder desk, nice orig finish, rebuilt interior, 90"
Cherry & flamed maple sideboard, full pilasters, scrolled splash, orig hrdwre, rich old finish, reads "Osewego, 1834"